mechanism of the highest class and an armoured plate). The lock is recommended for installation in entrance doors of private premises and public buildings (metal, steel, reinforced, armored) as well as in fireproof doors. 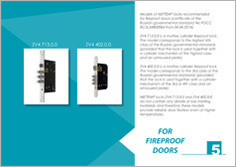 The model was successfully tested in the door with the fire resistance of EI 60.